We didn't use our ice cream maker much at all this Summer. I decided that I couldn't let the warm weather go away without making ice cream at least once this year. 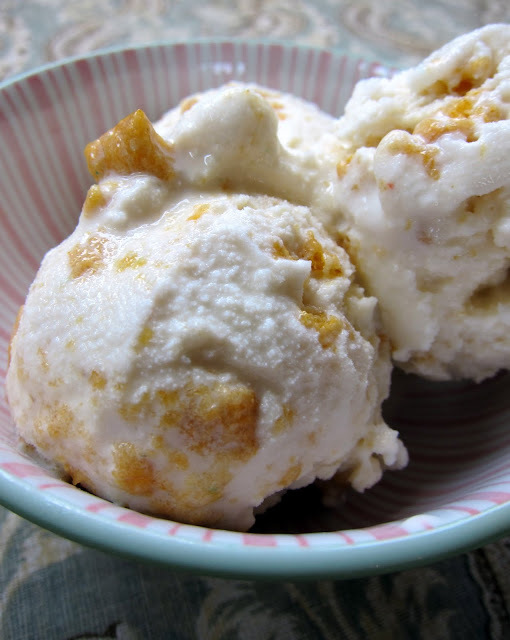 I was looking for a simple, no cook ice cream and found this Eagle Brand recipe that seemed to fit the bill. It was incredibly simple to mix together and it tasted fantastic! We both loved the crushed up Cap'n Crunch cereal in the ice cream. It was like eating a bowl of frozen cereal and milk. Chicken Legs said he liked this better than our Krispy Kreme Ice Cream. I don't know about that, but it was really, really good. Combine all ingredients except cereal in container of ice cream maker; mix well. Freeze according to manufacturer’s instructions. Stir in crushed cereal. You may serve now or transfer to a lidded container and place in freezer until firm, approximately 3 hours. I found your blog through pinterest and am working my way through some of your recipes:) I thought I would share my favorite no-cook vanilla ice cream recipe (I found it through searches for recipes that not only required no cooking, but also not 100 ingredients or labor-intensive prep) It is always gobbled up quickly with rave reviews! 1. In large bowl, beat together eggs, evaporated milk, cream, condensed milk, sugar and vanilla with electric mixer. 2. Beat in pudding mix until smooth. 3. Pour into freezer canister of ice cream maker and add enough milk to bring mixture to the fill line. 4. Freeze according to manufacturer’s directions. I know my grandkids would love this ice cream recipe. I've never used sweetened condensed milk before and am looking forward to trying this. My favorite cap'n crunch is the peanut butter! So creative! And pretty genius. I love capn crunch... brings out the kid in me. I bet it's amazing in ice cream form. I'm off to check out your krispy kreme ice cream! hummada, hummada, hummada! This is mega awesome and Crunchberries would be even better!